As an East Coast man I always seem to find myself watching Mountain West Conference football when I’m going to bed. Year in and year out I find at least one player that catches my attention. During the 2018 season that player was Utah St. RB Darwin Thompson. Many in the dynasty community may not be familiar with this small school prospect. He was a JUCO transfer who only spent one season in the Mountain West conference but what a season it was. Let us take a look at this promising rookie and see some of the skills he will bring to the next level. The first thing the casual fan will notice about Thompson is his diminutive stature. He measures in at a compact 5’8/200 lbs. Some may see this as being too small but Thompson is powerfully built and carries his weight well for his overall size. The NFL player I find most similar in size and ability would be Devonta Freeman. Both players use their short stature and powerful lower bodies to play a much more physical brand of football than you would assume at first glance. Thompson takes pride in being a gym rat routinely out lifting far larger o-lineman. He can squat 695 lbs. and power clean 385 lbs. You can see from his stats below that Thompson was a prolific producer for the Aggies in his only season in Logan. 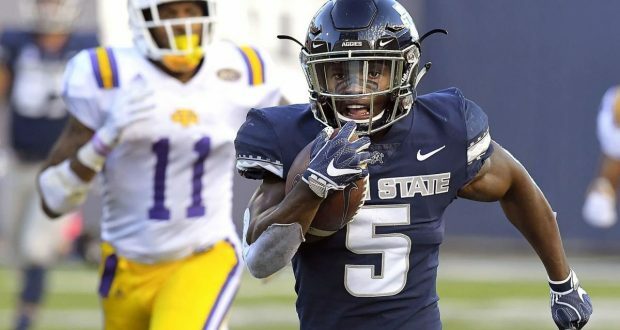 Utah State rode their talented tailback to one of the best seasons in school history finishing with an overall record of 11-2 culminating in a 52-13 drubbing of North Texas in the New Mexico Bowl. The Aggies finished the season ranked in the top 25 of both the AP and Coaches poll. Despite all of his success Darwin Thompson was not invited to the NFL scouting combine in Indianapolis. 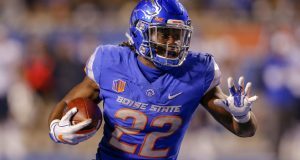 The young RB was determined to make an impression on NFL scouts at the Utah St. Pro Day this past week and certainly did with an impressive showing across the board. 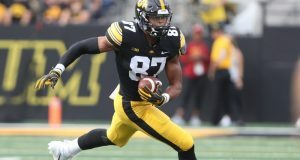 Thompson wowed on the vertical (39 inches), the broad jump (126 inches), on the bench (28 reps), the short shuttle (4.15 seconds), and the 40-yard dash (4.47 seconds). Nearly all of these numbers would have had him near the top of each drill had he been invited to the scouting combine. You can see from his highlight real below just what type of dynamic athlete Thompson is. You can see from his running style that Thompson manages to keep a wide base giving him elite balance reminiscent of players such as Devonta Freeman, Darren Sproles, and Tarik Cohen. He manages to run behind his pads with good power relative to his overall size routinely running through arm tackles. USA Today sports credits Thompson with compiling 1,210 yards after contact in his lone campaign at Utah State. The same source also credits Darwin with forcing 61 missed tackles on only 175 carries displaying elite elusiveness. During his single season with the Aggies Thompson also showed himself to be a more than capable pass catcher. This will be an important trait as he transitions to the next level. I would anticipate after his impressive Pro-Day performance Darwin Thompson will be a mid to late round selection in the upcoming NFL draft. He will immediately slot in as a dangerous return man. He absolutely has the ability to be a dynamic weapon for an NFL team. His stature will dictate that he not be given Bell-Cow type touches. However, as other smaller RBs have shown in recent years players can make a significant impact on limited touches. Thompson could be a nice option in PPR leagues depending on his landing spot. As you can tell from my earlier musings my top comparison for Darwin Thompson is Devonta Freeman. Only time will tell if Thompson can make a similar impact at the next level.